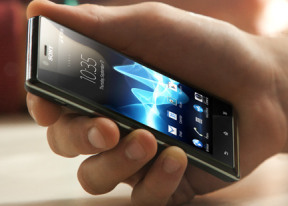 The Xperia J features a 4-inch LCD of FWVGA resolution (854 x 480 pixels), and pixel density of 245ppi. It's not a Reality display though, which means that it comes without the Mobile BRAVIA Engine. That may be a software tweak but it has its impact on photo browsing and video watching. Auto brightness is not available either, meaning you will have to work harder to get the best out of a screen that otherwise offers more resolution than usual for the price range. The on-screen images are reasonably crisp, with lively colors and quite impressive contrast. Viewing angles are quite poor though: the colors get washed out rather quickly and contrast is drastically deteriorating. The latter will be certainly appreciated by people who care about their privacy, but might make sharing your screen slightly harder. Here's how the Sony Xperia J did in our dedicated display tests. You can find more about our screen testing procedures here. The Xperia J is neither impressively slim, nor does it boast some exceptional finish, but we found it to be quite comfortable to handle and the curved design is a statement on its own in the budget class. What we're not so happy about is the fingerprint-prone front and the low position of the capacitive keys. The absence of a camera key is, sadly, becoming the norm, even for way more expensive smartphones. The non-hot-swappable memory card is an inconvenience as well.